What Is the AP Capstone Program? For years, high schools across the globe have offered Advanced Placement (or AP) courses that allow students to engage with college-level curricula and potentially earn college credit. However, AP Capstone is a new diploma program that supplements these courses and focuses on scholarly research and teamwork. Implemented by the College Board in the fall of 2014, the program is currently available in a handful of schools, with an eye toward expanding into others. It consists of three components: AP Seminar, AP Research, and four additional AP classes. 1. AP Seminar AP Seminar is a foundational course, which means that it is often a stude ... Read More About What Is the AP Capstone Program? How Will the AP Physics B Exam Change in May 2015? In May 2015, the Advanced Placement (AP) Physics B exam will undergo some change. Reviewing the breakdown of these changes below will help students to ensure readiness for the new exam when it premieres. The need for change The National Research Council (NRC) recently determined that the AP Physics B course covered too wide a breadth of material – so wide that students were not developing a deep enough understanding of concepts. To improve exploration of such materials, and to expand the scope of knowledge covered, the NRC made a recommendation that AP Physics B be divided into a two-year course, effectively doubling its le ... Read More About How Will the AP Physics B Exam Change in May 2015? How Will the AP U.S. History Exam Change in May 2015? In May of 2015, there will be changes to the Advanced Placement U.S. History test. These changes have been in the works since 2006, with the new framework rolled out in 2012 to give teachers the chance to prepare themselves and their students. There will also be changes to the AP Physics B Exam in May 2015 as well. 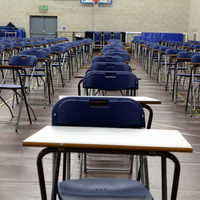 So, what will the new exam look like? How has it changed, and why? Why is the exam changing? The prior AP U.S. History exam was heavily criticized. Mainly, critique focused on the exam’s length, as well as its questions spanning such a wide range of potential topics that students did not always know what to s ... Read More About How Will the AP U.S. History Exam Change in May 2015? Oberlin College, Bachelor in Arts, Political Science and Government. University of Georgia, Master of Social Work, Social Work.